Peter Lombard (born in Lombardy), was a student and then teacher in Paris, where he became archbishop shortly before his death in 1160. He wrote a number of commentaries and theological works in the 1140s-1150s, including his commentary of the New Testament letters of St. Paul, which became a standard text throughout the rest of the Middle Ages. The title on this spine of this volume, no doubt copied from the former binding, states that it was owned by the Franciscan convent in Canterbury. 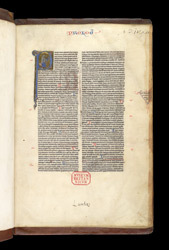 The prologue of his commentary on St Paul begins with a historiated initial (first letter bearing a picture) depicting the scholar writing. A portrait of the author at the beginning of a book comes from a Roman tradition which was taken up by medieval scribes. The short inscriptions in red in the margins are the abbreviated names of Peter Lombard's sources: Augustine, Thomas Aquinas, Jerome and Origen--an early form of footnote or even hypertext. The lozenge-shaped frame contains another form of note or heading to aid the reader.